Despite the attribution of this painting and its pendant, Scène galante, to the eighteenth century, the poor quality of the works suggests that they were executed in the nineteenth century or later. 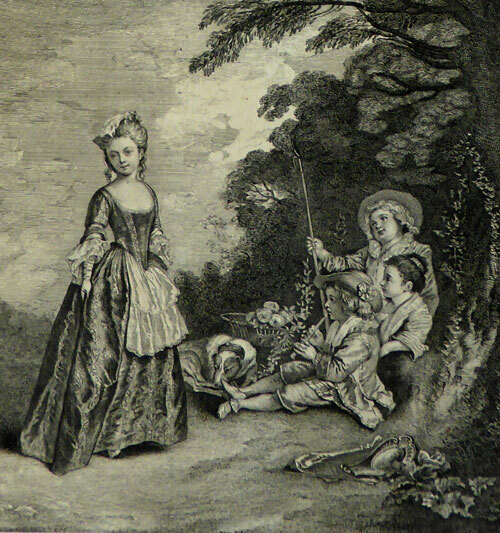 Charles Nicola Cochin after Watteau, Iris, c’est du bonne heure, engraving. 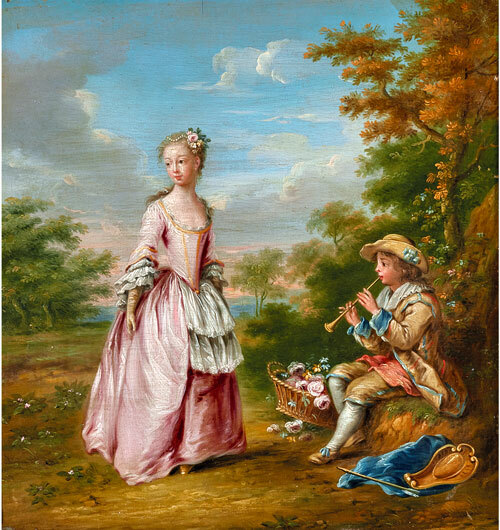 This painting was based on two figures from Charles Nicolas Cochin’s engraving after Watteau’s Iris, c’est du bonne heure. Whereas Watteau’s young shepherd sat directly on the ground and evoked pastoral charm, the copyist posed the boy in a more ordinary seated position. The young girl’s distinctive and colorful costume was changed into a plain, uninteresting dress. Watteau’s evasive, equivocal exchange between the flute player and young woman has likewise been lost. The landscape is wholly the pasticheur’s invention.